Jumpstart your writing by questioning the way things are and the way they ought to be with this article template. Well, we can’t predict the answers to these questions with complete certainty, but we can think about the possible consequences of these imagined events. 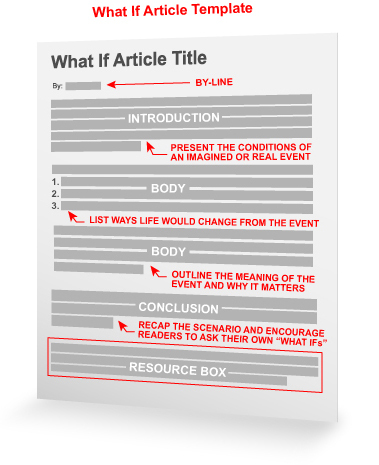 This article template is one way to embrace the “What If” thought experiments in life and turn them into articles. Create an Imagined Event – Think of an event that would have an impact on the future. This could be a personal life event or an event that has a broad impact on society. The type of event will be different based on your niche. Here’s where you need to get creative. The more imaginative, the better. Write a Revealing Title – Identify the event, but leave it open to interpretation. This will pull readers in have them looking for answers. Include the entire “What If” in the title if it can be communicated concisely. Add a Compelling Introduction – Tell the story of how the scenario happens. Present the conditions of the event and anything leading up to it. List Ways Life Would Change – List ways life would be different because of the event. This includes the event itself and things that happen in the future. This might be the most challenging part of the thought experiment, but if the idea comes from a natural vision, it’ll be really valuable. Say Why it Matters – Outline the meaning of the event. Discuss whether the event is probable and how close it is to reality. So are you ready to think about the future? Test your mind and the next time you think “What if X happened right now?” write that thought down and add it to your next high-quality article set. Also, leave a comment to share your train of thought. Excellent report! So simple, but something any of us can implement right now! Thanks for the newsletter. I’ve learned so much from you! Me too in one day my eyes are wide open ! I really hadn’t thought of writing a “What If” article about travel or global medical insurance, but I think I will try it. I think that people tend to put themselves into the story and it might be effective. I have used many variations of the “What if” template motif. And I believe as the article writer plays around with this, they will fall into a personally inspiring perference. And I’d add that customers also ask lots of “what if” questions, and just take those and make that question into a title, and answer it. In fact, I bet if you go through your emails from clients you will find these questions that you’ve already answered, and basically there is an article right there. All you need to do is tweak it into article material, and you will be amazed how well received these articles will be. Indeed, you can use these articles next time your client asks that same question again, just email them the link here at EzineArticles, I do it all the time. And you can also take these articles, chop them down slightly and post them on hour Q and A section on your website too. Please be thinking here as this is terrific advice, it’s spot on. Chris it right here, listen to what he’s saying. Thank you for all the EzineArticles Trainings and writing tips you provide. They are very useful and most of all inspiring. Gave me a great idea about the next article topic and title. I hate myself for always (literal, not hyperbole) being negative about, okay, everything. This article suggests going through life conscious, aware, alert, looking for cause and effect. I thought that’s what we were all supposed to do. I was wrong. Few people do this to any meanginful degree whatsoever. And this article alludes to the number one piece of advice given to writers: Write what you know. Again, nothing but agreement from me. Conclusion? A good writer effectively removes all “what if’s” from his personal life and can indeed rather accurately predict “bigger picture” life as well. Bad news? No one cares. In essence, you, me, writers, are to tell them “what” to think. Do as this advice suggests–the only way I know how and what to write–and you’ve entered the unwelcomed, and certainly unrewarding world, of telling people “why” to think for themselves. And people, again, most people, have no desire in placing their personal lives under such scrutiny. Put this way: Socrates might have said “The unexamined life isn’t worth living,” but he never once suggested it was HIS life he’d examined, now did he? The writing suggested here requires honesty of character and integrity above the desire for “success” as a writer. It requires passion for life. There’s little market for it these days. Great article and very timely! After writing only a handful of articles and then getting bogged down in my day job several weeks ago, I decided last night to ‘get back at it’ this weekend! Perfect timing! Thanks! Excellent idea! If you ask the right questions, some people are curious enough to reply with their answer. Now, my mind is getting in high gear. I enjoyed that email enough that I was thinking of replying to mention it, then saw the option to leave a comment. Hadn’t even thought of doing this but like the idea. What a fantastic idea! Immediately I thought of my recent blog post. I’d been thinking for a while that most people have something they want to do, but for some reason they just don’t do it – or get around to it. I found a solution using my own life as an example, which is what I write about in the blog post. The ‘What If’ template idea from your article had me realize how I could tell people about it and have them interact about it, brilliant! I’ll definitely be writing my ‘what if’ article! What if Fiona Becomes a Devastating Hurricane? I’d learned the what if method years ago in a creative writing class. I never thought of using it as a non-fiction article starter. Thanks for reminding me. Wow, this is a very good way of writing an article (never thought of doing it this way). I think I am going to try using this technic the next article I write on my blog. It is really a great idea. I have not yet applied this format in my writing but will sure try out in future articles. I recently wrote few articles that have semblance of this template but the idea never crystallized clearly in mind until I read this. thanks for making my mind clear. I think this “what if” will open new ways to find things to write about. This helps to find better introductions to new articles. I will definetly use it, thanks a lot. Love this idea and will implement this week when writing my articles. Thanks for the info!! What if the leaders of every country came together and agreed to world peace? Of cource, the step how to write a good article is good. Tks. Thanks for this, I always appreciate good ideas… just a relative newb when it comes to article marketing but I am still very fussy about content in my articles. Thank you for out of the box thinking. I can’t help but wonder would have happened if Mabarak had not been willing to leave Egypt. What would have been the US position and what would be the fallout in this country as a result? And I wonder “What If” the same sorts of protests occure in Venezuela or Iran – which I’d wager to say is likely indeed. Oh, and also Bolivia, it seems “inflation” and less-than-stellar leadership, along with the Internet Smart Mobs are converging – and the world is changing – What if – this continues?